Rain can be the biggest fear of many future newlyweds, but despite of their concerns, rain can add a lot of options for the photoshoot. Just remember one thing, don't let anything stop you from celebrating, and trust your wedding photographer. Rain can add a very romantic mood to your photo session. Photos with umbrellas can be so cute that you might even wish for rain! The rain can add a nice cinematic result to your pictures. Often when taking photos on a rainy day people are less concentrated on posing and that is when a photographer can capture a perfect moment of eternity. Raindrops can add a beautiful effect to any subject, a car or a window reflection, and it looks absolutely perfect on a black and white photos. Believe it or not, but the daylight on a rainy day can bring out more bright colors. In fact, any bright color (red, orange yellow or green) can look more saturated on a rainy day. Embrace the weather and enjoy it. The pouring rain is not the easiest condition to work for your photo/video team, but most often you can have a very fun and satisfying results. If you already know that the day will be rainy, think of using your umbrellas as props and reflectors for your photos. 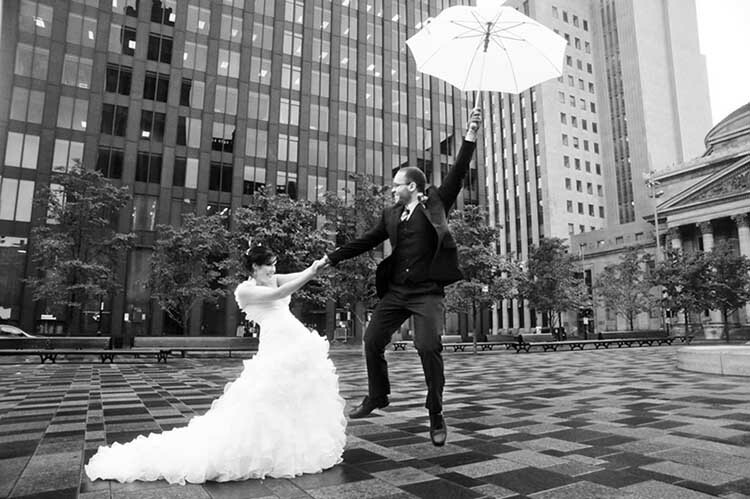 Umbrellas can make for a great addition to the wedding photos. Just make sure you pick the right colors to coordinate with your wedding theme and pick less patterns and large advertising across it. Clear umbrellas always look good on any picture and they perfectly coordinate with any color. In worst case scenario, it is always possible to do a "coupe together" photo shoot inside of the reception hall. It has already happened to me a few times and the result was amazing. If you hear from your photographer that he cannot work during the rainy weather conditions just run away ... He is either lazy or simply lacks his imagination. If you're planning an engagement photo shoot, having rain on that day is not a bad idea at all. A light drizzle or a huge downpour will encourage you to cuddle close to your partner under the same umbrella and the patter of the rain can be the sweetest sound you'll hear, the sound that is associated with love and romance. Plus, there is a chance that you might see a perfect rainbow when the rain stops, which can create a beautiful backdrop for your photos. And don't forget use those puddles to your advantage, you can find many interesting and unique reflections for your photos. Everybody loves a summer wedding, but a winter wedding can be terrifically glamorous, magical and cinematic. You have so many options and right elements to create a winter wonderland wedding. Beautiful ice that shines like diamonds and white snow that coordinates with white bridal gown, a romantic fireplace and cozy wraps will create a beautiful and unforgettable winter wedding.